"[W]hen you have 20% of a market and ... your next biggest competitor is a quarter of your size, you have a lot of buying power and so we buy better." The history of renewable energy in the U.S. is littered with companies that did it wrong — and one that appears to be getting it right. Today, NextEra Energy is the world's largest provider of wind and solar power, outpacing rivals not just in the U.S., but the hot renewable markets of Europe and China. It also has a healthy utility business in Florida Power & Light and is a major merchant power generator with nearly 20 GW of capacity. The achievement is the product of steady, disciplined growth under NextEra's executive team, particularly Jim Robo, who was named CEO in 2012. A former GE finance executive, Robo completed the expansion of NextEra from its Florida-based utility business into an international clean energy player. In 2018, he may have seized on the final acquisition to make his company financially sustainable for the long haul. While rivals built wind and solar on speculation, racking up debt, NextEra charted its renewable energy growth by winning power purchase agreements with utilities and large consumers, securing income for decades in the future. "We've had a terrific year this year," Robo told an investment conference in October, "but by our math, we've had about 20%, 22% share of PPAs that have been signed here to date in the renewable space." That 2018 performance is an improvement over NextEra's overall market share for renewable energy PPAs in the U.S., which Robo pegged at 15%. The company was an early entrant in the renewables space in the U.S. and its scale allows it to underbid many of its rivals. "Another piece of scale is the fact that we build cheaper and we buy better than anyone," Robo told the conference. "So when you have 20% of a market and .... your next biggest competitor is a quarter of your size, you have a lot of buying power and so we buy better." Those aggressive bidding strategies have helped put NextEra on the forefront of some of the cheapest clean energy plans in the nation. This summer, NV Energy announced deals with the company for solar at $23/MWh and two solar-plus-storage facilities below $30/MWh. 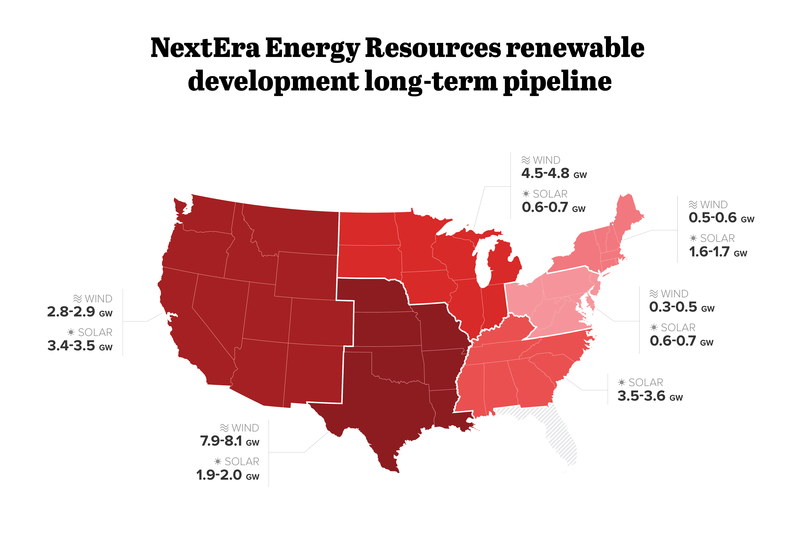 NextEra has also had success in recent years siting new pipelines, with FERC approving its 300-mile Mountain Valley Pipeline last year, but one central acquisition evaded it: a second regulated utility. Despite growing its renewables business more sustainably than most, the company was still highly leveraged due to its growing wind and solar stakes and its large merchant generation fleet. In that situation, generators often look to purchase regulated power utilities, which provide a steady rate of return and are viewed as safer investments. NextEra had long tried to secure such a merger, first in Hawaii and then Texas. But Hawaii regulators determined its application to buy the state's dominant utility lacked necessary detail and Texas officials took issue with the financial terms of its $12 billion application for Oncor. In 2018, market dynamics presented Robo with a unique opportunity to add a regulated power provider. NextEra struck a deal with Southern Co. to buy Gulf Power, a 462,000-customer utility in Northern Florida. Southern had owned the company for over a century, but needed cash to compensate for its over-budget Vogtle nuclear plant in Georgia. NextEra's acquisition would put the company on firmer financial footing in the eyes of Wall Street and its presence in Florida, where the company holds strong influence over regulators and lawmakers, will reduce the risk of rejection. NextEra's Florida operations have attracted criticism, notably from renewable advocates who point out its recent rush to build gas generation in the state and curtail private rooftop solar. But those actions also drove higher returns for company shareholders through more ratebased investments. In the years ahead, NextEra's position is likely to solidify as a renewable energy leader, even as it keeps a foot in the fossil fuel economy.